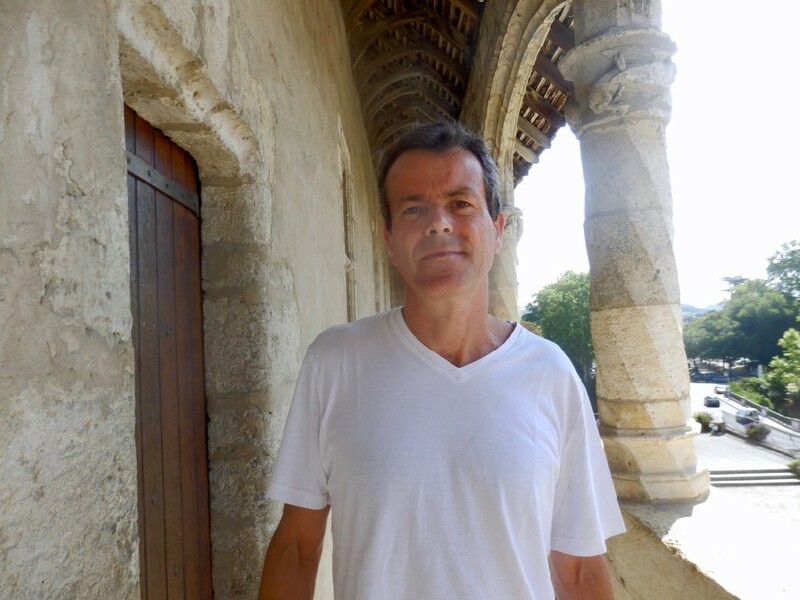 Tankersley collaborated with Frederic Bauduer, a visiting biological anthropologist and paleopathologist from the University of Bordeaux, UC’s sister university in France, to ultimately dispel previous academic literature claiming the sculpture as portraying achondroplasia. 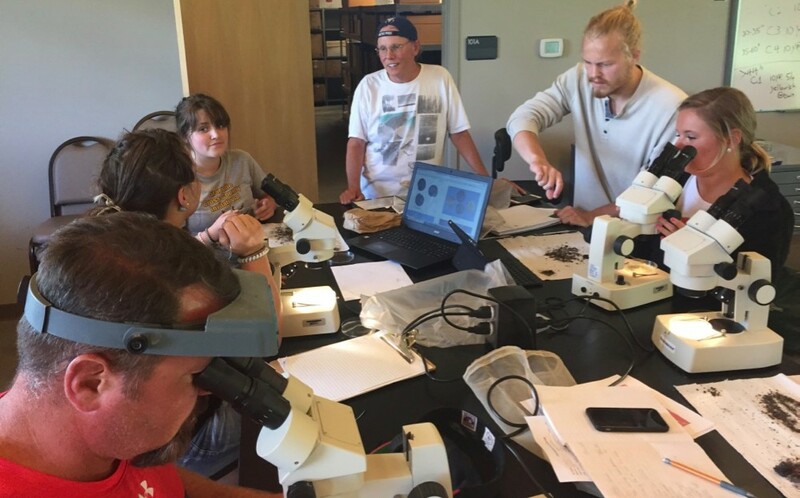 Tankersley (top center) teaches archaeology students to date soil, bones and textiles using radiocarbon science. The figure’s bulging neck (goiter) and appearance of short stature are actually results of iodine deficient thyroid disease. The legs are bent in a tilted squat likely during a Native American ceremonial dance. was part of the so-called U.S. “goiter belt” where goiter frequency was relatively high — five to 15 incidences per thousand. The lower limbs on the statue, previously documented in the literature as short in stature, are actually normal size in bone length, according to Bauduer. Upon closer inspection, both Bauduer and Tankersley agree that the figure is also portrayed in a tilted squat, a common gait anomaly found in people with hypothyroidism. This paper looks like it’s behind a paywall. 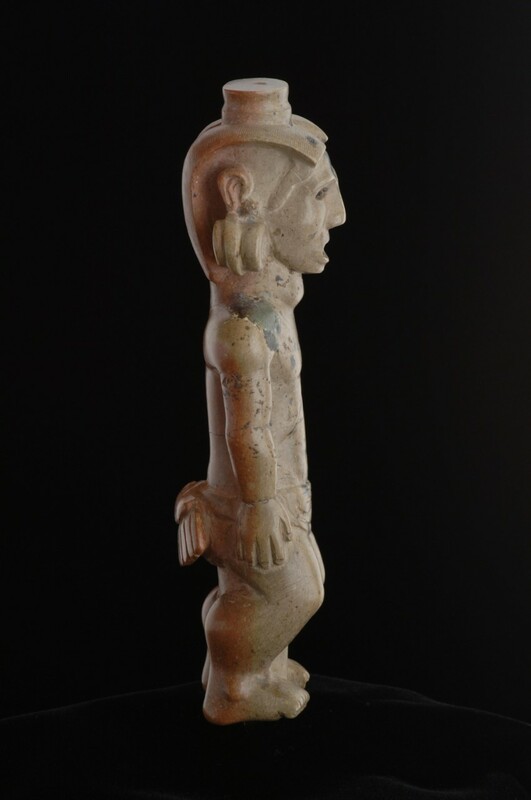 This entry was posted in science, Visual Art and tagged achondroplastic dwarf (AD), Adena Burial Mound, Adena pipe, art history, art/sci, art/science, Delaware Nation, F. Bauduer, France, Frederic Bauduer, goiter, goitre, hypothyroidism, Indiana, iodine deficiencies, K. Barnett Tankersley, Kenneth Tankersley, Kentucky, Medical Hypotheses Evidence of an ancient (2000 years ago) goiter attributed to iodine deficiency in North America, Miami Nation, Native Ohio Valley Shawnee Nation, Ohio, Ohio Valley Native American, Ojibwa Nation, paleopathology, radiocarbon dating, SciArt, thyroid tumor, tobacco, tobacco pipe statue, University of Bordeaux, University of Cincinnati, US, US goiter belt on October 5, 2018 by Maryse de la Giroday. Case Western Reserve University Radiology Professor Mark Griswold knew his world had changed the moment he first used a prototype of Microsoft’s HoloLens headset. Two months later, one of the university’s medical students illustrated exactly why. Today, Griswold told tens of thousands of people how HoloLens can transform learning across countless subjects, including those as complex as the human body. Speaking to an in-person and online audience at Microsoft’s annual Build conference, he highlighted disciplines as disparate as art history and engineering–but started with a holographic heart. In traditional anatomy, after all, students like Ghodasara cut into cadavers to understand the body’s intricacies. In other words, technology not only can match existing educational methods–it can actually improve upon them. Which, in many ways, is why Cleveland Clinic CEO Toby Cosgrove contacted then-Microsoft executive Craig Mundie in 2013, after the hospital and university first agreed to partner on a new education building. As Cosgrove, Case Western Reserve President Barbara R. Snyder and other academic leaders engaged more extensively with Microsoft, the more potential everyone saw. After a small group including Griswold, engineering professor Marc Buchner and Cleveland Clinic education technology leader Neil Mehta first experienced HoloLens in December, the faculty returned to Cleveland to create a core team dedicated to exploring the technology’s academic potential. In February, 10 members of the team–including Ghodasara–returned to Microsoft for a HoloLens programming deep dive. Ghodasara already had taken the traditional anatomy class at Case Western Reserve, but it wasn’t until he used the HoloLens headset that he first visualized the aortic valve in its entirety–unobstructed by other elements of the cardiac system and undamaged by earlier dissection efforts. Members of the Microsoft team were in the room when Ghodasara had his “aha” moment; a few weeks later, the heart demonstration became part of the Build conference agenda. Case Western Reserve is the only university represented during the three-day event, a distinction Griswold attributes in part to the core team’s breadth of expertise and collegial approach. When Griswold took the stage as part of Microsoft’s opening keynote at the Build conference, Ghodasara, Buchner and Chief Information Officer Sue Workman also were in the audience. Back in Cleveland, three of Professor Buchner’s undergraduates–John Billingsley, Henry Eastman and Tim Sesler–demonstrated some of the potential of the HoloLens technology live in the Tinkham Veale University Center. In truth, HoloLens ultimately could have applications for dozens of Case Western Reserve’s academic programs. NASA’s Jet Propulsion Laboratory already has worked with Microsoft to develop software that will allow Earth-based scientists to work on Mars with a specially designed rover vehicle. A similar collaboration could enable students here to take part in archeological digs around the world. Or astronomy students could stand in the midst of colliding galaxies, securing front-row view of the unfolding chaos. Art history professors could present masterpieces in their original settings–a centuries-old castle, or even the Sistine Chapel. For now, however, the top priority is creating a full digital anatomy curriculum, a process launched with the advent of the Health Education Campus, and now experiencing even greater momentum. Among the key collaborators are a team of medical students and anatomy and radiology faculty who are already investigating the use of these kinds of technology. This team, led by Amy Wilson­Delfosse, the medical school’s associate dean for curriculum, and Suzanne Wish-Baratz, an assistant professor who is one of the primary leaders of anatomy education, fully expects to have a digital curriculum ready for the new Health Education Campus. Also essential, Griswold said, has been the advice and assistance of Microsoft’s HoloLens team and executives. Ohio is not the only state where virtual reality is being incorporated into medical education. Incorporating eye gaze control, gestures, and voice commands while “walking around” inside an emergency medical experience, Next Galaxy’s Virtual Reality Model educates participants far beyond today’s methodology of passively watching video and taking written tests. Next Galaxy Corp (OTC: NXGA) recently announced the signing of an agreement with Miami Children’s Hospital to use the Company’s VR Model to develop immersive Virtual Reality medical instructional content for patient and medical professional education. Per the multi-year agreement, Next Galaxy and Miami Children’s Hospital are jointly developing VR Instructionals on cardiopulmonary resuscitation (CPR) and other lifesaving procedures, which will be released as an application for smartphones. Assessments are incorporated directly into the medical VR models, creating situations where participants are required to make the appropriate decisions about proper techniques. The Virtual CPR instructional will measure metrics and provide real-time feedback ensuring participants accurately perform CPR techniques. Further, the instructional will explain any mistake and prompt users to try again when errors are made. Supportive messages are delivered upon success. The medical VR models will be viewable through smartphones and desktops as 3D, and via VR devices such as Google Cardboard, VRONE and Oculus Rift. The best way to learn CPR is an immersive experience, Miami Children’s Hospital leaders believe — not a video. Next Galaxy (Pink Sheets: NXGA)’s virtual reality technology uses a smartphone app. Users can put their smartphone into a virtual reality headset for an immersive experience, or see 3D content through the phone. The application will be available to the public in the next few months, Spio said. The five-person company will be hiring about 20 full-time employees in the next six months, focusing on developers with 3D modeling and gaming experience, she said. Quadrupling the size of your company in six months can be quite a challenge. I wish them good luck with their expansion and their virtual reality course materials. This entry was posted in medicine, New Media, science communication, sscience education and tagged Amy Wilson­Delfosse, Barbara R. Snyder, Case Western Reserve University, CEEK, Celia Ampel, Cleveland Clinic, CPR techniques, Craig Mundie, Delos "Toby" Cosgrove, Florida, Henry Eastman, HoloLens, John Billingsley, Marc Buchner, Mark Griswold, Mary Spio, Miami-Dade Country Public Schools, Microsoft, NASA's Jet Propulsion Laboratory, Neil Mehta, Next Galaxy Corp., Ohio, Satyam Ghodasara, Sue Workman, Suzanne Wish-Baratz, Tim Sesler, US, virtual reality on May 6, 2015 by Maryse de la Giroday. Next, the trio sprayed the glass plate with a mist of water and retested the lizards, but this time the animals had problems holding tight: the attachment force varied each time they took a step. The droplets were interfering with the lizards’ attachment mechanism, but it wasn’t clear how. And when the team immersed the geckos in a bath of room temperature water with a smooth glass bottom, the animals were completely unable to anchor themselves to the smooth surface. ‘The toes are superhydrophobic [water repellent]’, explains Stark, who could see a silvery bubble of air around their toes, but they were unable to displace the water surrounding their feet to make the tight van der Waals contacts that usually keep the geckos in place. Then, the team tested the lizard’s adhesive forces on the dry surface when their feet had been soaking for 90 min and found that the lizards could barely hold on, detaching when they were pulled with a force roughly equalling their own weight. ‘That might be the sliding behaviour that we see when the geckos climb vertically up misted glass’, says Stark. So, geckos climbing on wet surfaces with damp feet are constantly on the verge of slipping and Stark adds that when the soggy lizards were faced with the misted and immersed horizontal surfaces, they slipped as soon as the rig started pulling. Principal investigator Stark and her fellow UA researchers Ila Badge, Nicholas Wucinich, Timothy Sullivan, Peter Niewiarowski and Ali Dhinojwala study the adhesive qualities of gecko pads, which have tiny, clingy hairs that stick like Velcro to dry surfaces. In a 2012 study, the team discovered that geckos lose their grip on wet glass. This finding led the scientists to explore how the lizards function in their natural environments. The discovery, “Surface Wettability Plays a Significant Role in Gecko Adhesion Underwater,” was published April 1, 2013 by the Proceedings of the National Academy of Sciences. The study has implications for the design of a synthetic gecko-inspired adhesive. Not mentioned in this news release, one of the relevant applications for this work would be getting bandages and dressings to adhere to wet surfaces. This entry was posted in biomimcry, medicine, nanotechnology and tagged Ali Dhinojwala, Alyssa Stark, geckos, Ila Badge, Nicholas Wucinich, Ohio, Peter Niewiarowski, superhydrophobic, Surface Wettability Plays a Significant Role in Gecko Adhesion Underwater, Timothy Sullivan, University of Akron, Van Der Waals Forces on April 3, 2013 by Maryse de la Giroday. Put another way, the new galleries at CMA tackle the problem plaguing most ambitious UI projects today: How do you let the content shine, and get the tech out of the way? How do you craft an interaction between bytes and spaces that feels fun? … Gallery One, a unique, interactive gallery that blends art, technology and interpretation to inspire visitors to explore the museum’s renowned collections. This revolutionary space features the largest multi-touch screen in the United States, which displays images of over 3,500 objects from the museum’s world-renowned permanent collection. This 40-foot Collection Wall allows visitors to shape their own tours of the museum and to discover the full breadth of the collections on view throughout the museum’s galleries. Throughout the space, original works of art and digital interactives engage visitors in new ways, putting curiosity, imagination and creativity at the heart of their museum experience. Innovative user-interface design and cutting-edge hardware developed exclusively for Gallery One break new ground in art museum interpretation, design and technology. Comprised of three major areas, Gallery One offers something for visitors of all ages and levels of comfort with art. Studio Play is a bright and colorful space that offers the museum’s youngest visitors and their families a chance to play and learn about art. Highlights of this portion of Gallery One include: Line and Shape, a multi-touch, microtile wall on which visitors can draw lines that are matched to works of art in the collection; a shadow-puppet theater where silhouettes of objects can be used as “actors” in plays; mobile- and sculpture-building stations where visitors can create their own interpretations of modern sculptures by Calder [Alexander Calder] and Lipchitz [Jacques Lipchitz]; and a sorting and matching game featuring works from the permanent collection. This space is designed to encourage visitors of all ages to become active participants in their museum experience. In the main gallery space, visitors have an opportunity to learn about the collection and to develop ways of looking at art that are both fun and educational. The gallery is comprised of fourteen themed groups of works from the museum’s collection, six of which have “lens” stations. The “lens” stations comprise 46” multi-touch screens that offer additional contextual information and dynamic, interactive activities that allow visitors to create experiences and share them with others through links to social media. Another unique feature of the space is the Beacon, an introductory, dynamic screen that displays real-time results of visitors’ activities in the space, such as favorite objects, tours and activities. In concert with the opening of Gallery One, the museum has also created ArtLens, a multi-dimensional app for iPads. Utilizing image recognition software, visitors can scan two-dimensional objects in Gallery One and throughout the museum’s galleries to access up to 9 hours of additional multimedia content, including audio tour segments, videos and additional contextual information. Indoor triangulation-location technology also allows visitors to orient themselves in the galleries and find works of art with additional interpretive content throughout their visit. The museum partnered with several other companies to complete the project, including Local Projects (media design and development), Gallagher and Associates (design and development), Zenith (AV Integration), Piction (CMS/DAM development), Earprint Productions (app content development), and Navizon (way-finding). In one display, a computer analyzes the expression on a visitor’s face. Then, they can see work spanning thousands of years that matches their own visage. Gallery One also offers a chance to directly experience the physical decisions behind how masterpieces are made. For example, in front of a Jackson Pollack painting is a virtual easel, loaded with tools that approximate Pollock’s own, so that visitors can pour their own drip painting and compare it to the real thing. Sculpture Lens – Strike A Pose – Cleveland Museum of Art from Local Projects on Vimeo. Even as the designers go wild with the technology, they never stop to consider what anyone who doesn’t care about that technology would stand to gain. It was Barton’s [Local Projects founder Jake Barton] own skepticism about technology that made the technology great. His team didn’t necessarily believe that high-tech flare would add value to the museum experience. So they strove to look past the technology. As a technical writer, I had many, many arguments with developers about precisely that point; most of us don’t care about the technology. So, kudos to Jake Barton and all of the teams responsible for finding a way to integrate that understanding into a series of exhibits that allow the museum to showcase its collection, engage the public, and develop new audiences. Library and Archives Canada has asked the Council of Canadian Academies to assess how memory institutions, which includes archives, libraries, museums, and other cultural institutions, can embrace the opportunities and challenges of the changing ways in which Canadians are communicating and working in the digital age. These trends present both significant challenges and opportunities for traditional memory institutions as they work towards ensuring that valuable information is safeguarded and maintained for the long term and for the benefit of future generations. It requires that they keep track of new types of records that may be of future cultural significance, and of any changes in how decisions are being documented. As part of this assessment, the Council’s expert panel will examine the evidence as it relates to emerging trends, international best practices in archiving, and strengths and weaknesses in how Canada’s memory institutions are responding to these opportunities and challenges. Once complete, this assessment will provide an in-depth and balanced report that will support Library and Archives Canada and other memory institutions as it considers how best to manage and preserve the mass quantity of communications records generated as a result of new and emerging technologies. I last mentioned the ‘memory institutions’ assessment in my Feb. 22, 2013 posting in the context of their ‘science culture in Canada’ assessment panel. I find it odd that the Canada Science and Technology Museums Corporation was one of the requestors for the ‘science culture’ assessment but it is not involved (nor is any other museum) in the ‘memory institutions and digital revolution’ assessment. After reading about the Cleveland Museum of Art project, something else strikes me as odd, there is no mention of analysing the role that museums, libraries, and others will play in a world which is increasingly ephemeral. After all, it’s not enough to keep and store records. There is no point if we can’t access them or even have knowledge of their existence. As for storing and displaying objects, this traditional museum function is increasingly being made impossible as objects seemingly disappear. The vinyl record, cassette tape, and CD (compact disc) have almost disappeared to be replaced by digital files. Meanwhile, my local library has fewer and fewer books, DVDs, and other lending items. What roles will libraries, museums, and other memory institutions going to have in our lives? This entry was posted in New Media, Technology, Visual Art and tagged ArtLens, Caroline Goeser, Cleveland Museum of Art, Cliff Kuang, Council of Canadian Academies, David Franklin, Earprint Productions, Gallagher and Associates, interactive displays, Jake Barton, Library and Archives Canada, Local Projects, Maltz Family Foundation, Memory Institutions and the Digital Revolution, Navizon, Ohio, Piction, Zenith on March 6, 2013 by Maryse de la Giroday.